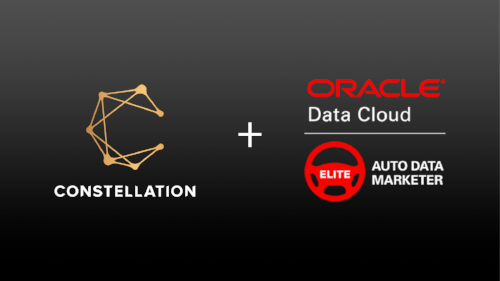 Constellation Agency was selected by Oracle Data Cloud to attain their Auto Elite Data Marketer designation. As a member of this program, Constellation is able to access Oracle’s powerful and expansive selection of digital targeting audiences for use in their paid social campaigns. The targeting abilities extend to both Constellation’s turnkey managed services as well as their self-service Launchpad platform. The automotive-specific data provided includes in-market vehicle shoppers down to the model line and body style level, existing owners, people in market for leases and auto finance, service and parts shoppers, and individuals at various credit score tiers. Oracle is able to capture in-market shopping intent by partnering with MasterCard, IHS, and TransUnion. The true power of this partnership is the potency of combining Oracle’s powerful third-party data with Constellation’s proprietary strategic approach. The data enables Constellation to expand the granularity used in their hypertargeting campaigns for the maximum benefit to clients. “We’re pleased to welcome Constellation Agency into the Elite Data Marketer program. Their cutting-edge campaign approach is uniquely suited to take full advantage of the data we can provide” said Tim Daher, Sr. Client Partner at Oracle Data Cloud. As an Elite Data Marketer, Constellation has access to much more than just the data. Leading partners within the program have access to specialized education and training, customized co-branded marketing support, and strategic sales support with access to Oracle’s retail solutions team. To learn more about how you can unlock this powerful data targeting, reach out to sales@constellationagency.com.